Faial is known as the Blue Island of the Azores Islands. This is because in the summer, everywhere you go there is blue. From the blue hydrangeas dividing farmers fields and along the roads to houses with blue accents. The capital city, Horta, has a rich history and many buildings with great architectural interest. Horta is famous for its colourful Marina and harbour. From 1919 to World War 2, the harbour was a very important landing spot for transatlantic flights that were equipped for sea landing. Long before that the harbour was, and is, a popular stop over for sailors. The marina is quite colourful thanks to the superstition that every ship that visits must make a painting in order to have a safe journey! The yachts themselves are often quite colourful. And the owners and crews of the yachts are certainly quite colourful themselves. They come from all over and add a very cosmopolitan feel to the city. The City of Horta has tourists in mind. They have prepared an audio tourist guide in Portuguese and in English that allows you to have a self directed tour of the city and its key highlights. And the city provides free wireless internet. This is a great benefit as you travel the Azores Islands. There is much to see and do outside of the City of Horta. At the far western tip of the island is Ponta dos Capelinhos. This is a popular tourist attraction. You can see, first hand, the result of a volcanic eruption in 1957/58. A whole new land mass was created and houses and fields were buried. An old lighthouse still stands. Visit the town of Capelo to see the Capelinhos Museum, which chronicles the active period of the volcano. Espalamaca is a great spot to go for a view of Horta. From this lookout you can see the city, the harbour, marina, the beach of Almoxarife, and the islands of Pico Azores and Sao Jorge Island. Pico is only six kilometres away. Another popular spot to visit is Caldeira. Caldeira is a large crater that is about 2 kilometres around and 400 metres deep. It is a natural reserve that is filled with flowers, trees and other natural vegetation. Close to the crater is Cabeco Gordo. This is the highest point of the island and offers another great view of Pico and of Sao Jorge. 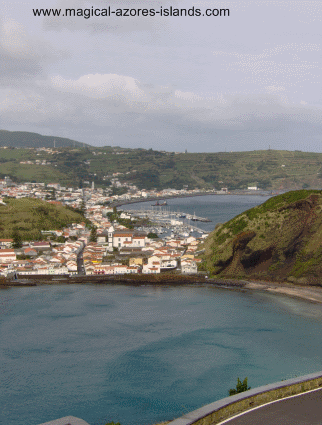 It is also a great vantage point to see all of Faial Island.